My name is Maria and I like to make things. When I am not working as a freelance graphic designer or tinkering with the press, you can either find me playing legos with my two young sons or sitting on the couch in front of the T.V. with my husband. My husband Mike gets nervous everytime I utter the words, "I just bought another press." It usually involves some heavy lifting and clearing out our already cluttered garage. I have three presses and named each of them after the person that sold them to me. Percy - The Kelsey Excelsior is the first press I ever owned. 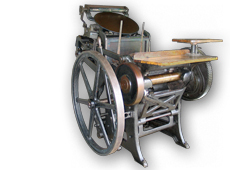 It has the most sentimental value; I used this press to print our wedding invitations. Mark - Acquired from the International Printing Museum in Carson, this is a C&P Pilot Press named after its director, a true gentleman who delivered and helped lug the 200 lb. machine up a flight of stairs to our apartment back then. Gene - The biggest and heaviest (1800 lbs.) of the three presses. Acquired from a retired printer who kept this C&P in his garage after he sold his printing business, fully intending to print some personal projects on the side. Gene is busy having a good time enjoying retirement with his wife, and never touched the press until I bought it from him. My letterpress work was recently featured in a book called Little Book Of Letterpress by Charlotte Rivers published by Chronicle Books and the Real Simple website. The Letterpress Issue of UPPERCASE Magazine. M Press greeting cards are sold at the Pasadena Museum of California Art store.